It's the first week of the brand new Christine's Rankings championship, and boy have we had some early contenders for you. Kevin Magnussen has burst onto the scene, making a triumphant return to Formula One and embracing the fact that he has done so looking like a banana. There's a bumper crop of points handed out in this first week, as the drivers gear up for the brand new season and start their campaigns in earnest. From Jolyon Palmer's surfboard, to Vettel's cheeky post-race hat throwing, there's a little bit of everything! +1 Jolyon Palmer: The car on a surfboard video, we need to see more personality but I do like that he's a waver. +1 Kevin Magnussen: The car on a surfboard video, mostly for that knowing nod. +2 Fernando Alonso: The body doubles are pretty obvious in this Chandon video but I like Alonso getting a cheeky headstart. It's also reminiscent of the "Anything You Can Do" days. Ah, good times. +2 Jenson Button: Also only appearing in the Chandon video briefly, but I like the idea of daredevil Button attempted a big old tractor leap! +2 Nico Rosberg: Doing his bit for the fans, via @PetaPan17: "Wow so super impressed with Rosberg right now. Lewis was late to signing so Nico went down and met with all the fans in the queue." 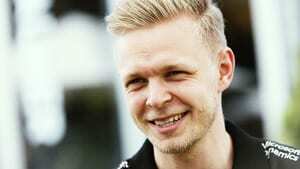 +4 Kevin Magnussen: It's got to be worth a handful of points for gleefully acknowledging you look like a banana. -1 Lewis Hamilton: You can wear fashion glasses if you must, but is it really the first thing you must do after taking off your helmet post-qualifying? +3 Esteban Gutiérrez: Bless Esteban so much for his slight Yoda Moment. "Races we have many..."
+1 Lewis Hamilton: Working on some excellent musical skills here, and I am so jealous of the gorgeous piano. +1 Fernando Alonso: Thinking of his family back at home when in the midst of a terrifying crash. +2 Sebastian Vettel: Referencing the good old Mercedes days with a spot of cap-throwing in the pre-podium green room in Australia. +2 Felipe Massa: Poking a bit of fun at the Mercedes drivers during a fan forum: "Easy life they have, eh? No simulator, very quick car, fighting for the victory..."
+1 Fernando Alonso: Indulging in a spot of reading whilst recovering from a hectic weekend in Australia.